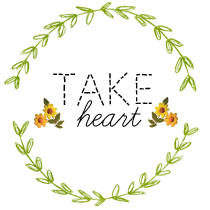 I am over at Take Heart sharing my love story. 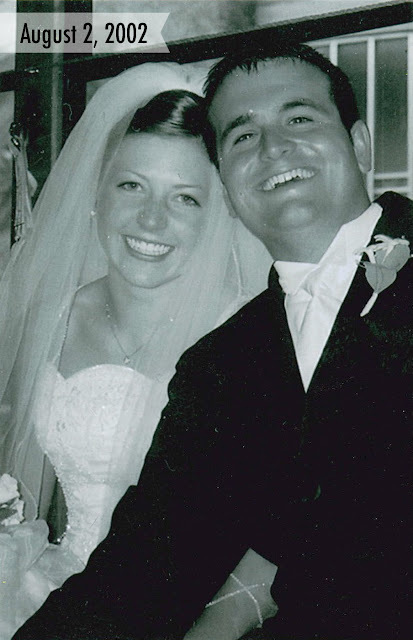 So, if you want to hear all about how I met and fell in love with my wonderful hubby, come visit me at Take Heart. And Danielle just had a sweet baby girl...so you can get your baby fix and tell her congrats while you are over there. 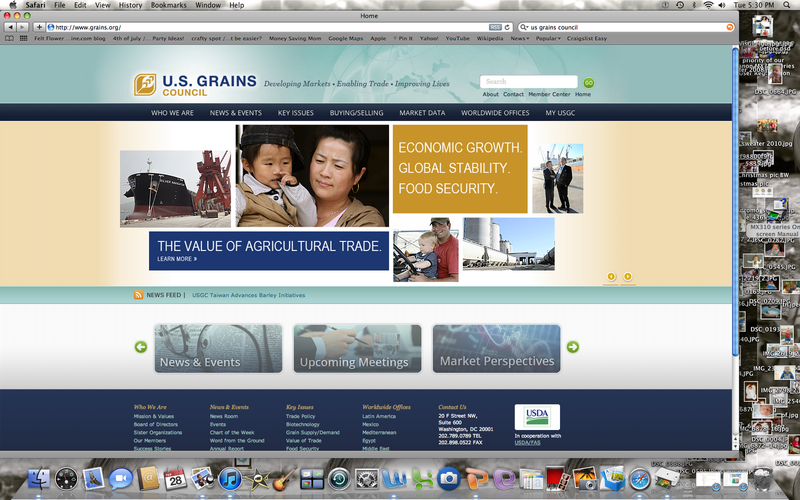 And Joel and Levi are on the U.S. Grains Council website. Sometimes on Mondays I feel like I just need someone to give me a ride until I can find the energy and brain power to get my gears going. Do you know the feeling? If Levi could just plop his mama in that wagon of his and pull me for a little bit I think it would help. He needs to burn some energy anyway...or maybe just pass some of that two year old energy on to me. This weekend I snuck outside to take some pictures of Levi pulling his wagon. He was totally in his own world...pulling and pushing away. He loves being outside. Last year he couldn't even budge the wagon on his own and this year he is pulling it all over the yard. And then he spotted me and started heading over in my direction. He pushed and pushed until he got as close to the camera as possible. He checked out some of his pictures and then got bored and was off again. And sometimes he just needs to catch his breath and have a snack. It is tough being a two year old! And even today there are many days that I open my tired eyes in the morning so thankful that I don't have to face the challenges of the day on my own. Knowing His mercies are new every morning and that He will give me just what I need for whatever that day and week holds...even on a Monday morning...that's what keeps me going. It has been awhile since I have posted any phone pictures. Here are a few of my boys. Levi has been really interested in Griffin all of a sudden. It is so sweet to watch him love on his little brother. Often it is with my phone that I catch those sweet moments. 1. Lots of brother hugs around here lately. 3. Starting the morning off by reading Knuffle Bunny to Griffin. 4. Caught holding hands during a Veggie Tales movie. Melt my heart. 5. Look out! Monkey on the loose. 6. We have had some really nice days around here...and stroller rides too. 7. Hanging out on the floor. 8. And hanging out in the rocker. Hopefully we will do lots more hanging out together this weekend too. Link up your Instagram photos at Life Rearranged. Levi loves his cousins. He talks about them all the time. He says each one of their names and asks where they are. He gets so excited when he gets to spend time with them. So, when I saw this idea for a cousin memory game I knew I had to make a game for each of Levi's cousins. And they ended up being the perfect "valentines" for our cousin Valentine party. I used Photoshop Elements to make the front of the cards with each cousins name, picture, and these papers for the background. Don't ask me how I did them. I know just enough about Elements to be dangerous. I am sure I made them in the most inefficient way possible. :) I used red mat board for the backs of all the sets except for Levi's...because I ran out. I had a hard time cutting the mat board with a knife so I ended up using my kitchen scissors which worked great but gave me blisters on my hands by the time I got done. Crafting is hard work! I put each set of cousin memory in a little bag and tied it with bakers twine. I was going to make a cute tag too...but I ran out of time...or I was too tired...I can't remember which! Of course Levi and several of his cousins are a little young to play cousin memory but who doesn't like a set of cards with their cousins faces on them?! Levi spent lots of time going through the cards and taking them in and out of his mailbox. We tried matching them but he was too excited about picking them up and looking at the pictures to do that for very long. And then he would mix them up and laugh. I think he thought that was the best part about cousin memory. Funny boy. For now they are just cards with his sweet cousins' faces on them...but later they will be a great game for him to play. I think I might need to make him a cousin picture book. He would love that. Somehow these months keep flying by. I know that "baby time" always goes fast, but how can you be getting so big. Five months already?! The past month has been a tiring one. All of a sudden you decided that you like waking your mom up all throughout the night. Not just once or twice, but all night long. And you also decided that you don't like to eat much during the day...you prefer to eat at night. To your defense, your big brother is so distracting during the day. You love him and when it is time to eat you usually prefer to watch him instead of eat. I guess there is no one to distract you from eating in the middle of the night! You are really throwing me for a loop with this crazy sleeping and eating schedule though. Your sister and brother were already sleeping 8-10 hours by five months, so most of the time I just don't know what to do with you! I guess we will just keep working on that schedule and one of these days I'm sure you will surprise me and sleep through the night. In the meantime, I am trying to enjoy every minute of our time together...even if it is at three in the morning and my eyes are heavy. Your big brother started noticing you all of a sudden this month. It is so sweet to see you interact with him and watch that brother bond beginning to form. You are pretty awesome, but he might be so interested in you because of all of your cool baby gadgets too. Levi likes your walker, Bumbo, and baby toys just as much as you do. In fact, he sometimes just plops himself in your car seat or Bumbo and chills out for awhile. But I think he mostly just likes you. He always asks about you when he wakes up, wants me to put you near him when he is playing, wants to read his books to you, brings you toys, tells me when you are hungry (he probably knows better than I do! ), and loves to take baths with you. He knows how to get the best smiles and laughs out of you too. This month you started sitting up...with lots of help of course. You love sitting in your walker and we recently started sitting you up in a Bumbo too. If we lay you down you are always arching your back and trying to sit back up. You will be so glad when you get a little more sturdy. This month you met your Uncle James for the first time, took your first trip to the zoo, and attended your first cousin Valentine party. You have been a busy boy. If you didn't wake up a zillion times a night, I would say that you are a perfect baby. You are perfect anyway though...perfect for our family. You still have such a sweet temperament and are content most of the time to just hang out with me and your brother. You love to be held and talked to. It is pretty easy to get you to smile and your daddy loves to make you giggle. I am so thankful that you are part of our family, sweet boy. I can't wait to see what another month with you holds. I am hoping it holds a little more sleep for us both! But even if it doesn't, I love you so much. They had the mailboxes in the dollar spot at Target again. They were a hit last year and this year they had turquoise mailboxes! Love that. So I went with a turquoise/red/pink theme. Besides the mailboxes, all the other decorations were things I had on hand. I might have to leave the happy heart banner up for awhile. It makes my kitchen so cheery. You can find the tutorial for the happy heart banner here. Instead of Valentines, I made a cousin memory game for Levi to give to each of his cousins. It was inspired by this one from Jones Design Company. Perfect for a cousin Valentine party! The kids drank red fruit punch from mason jars and red striped paper straws from Garnish. 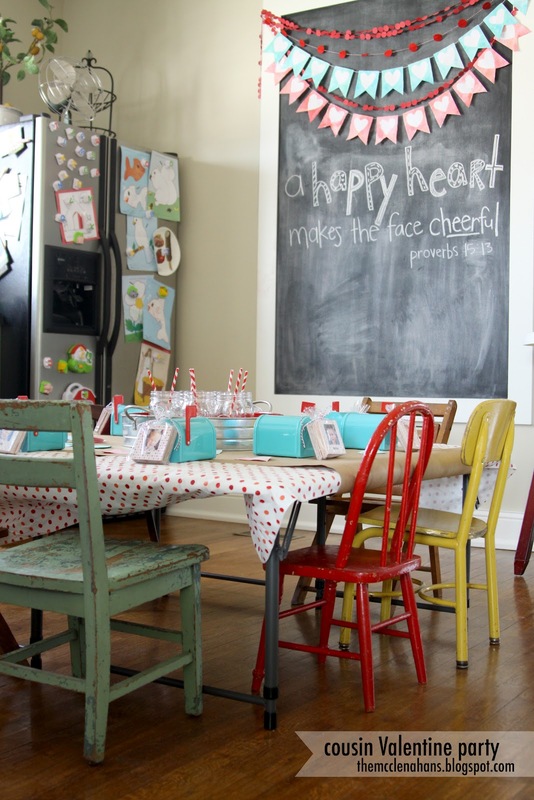 The vinyl polka dot table cloth was on clearance at Walmart at the end of the summer. I used kraft paper down the middle of the table and cut out water color hearts to spread around the table. Before the party, Levi and I made sugar cookies to decorate. Each cousin got to decorate two cookies to eat. Lots of frosting was used. Levi didn't even bother eating the cookies. Just frosting and sprinkles for him. And of course a big mess. But it is worth getting sprinkles everywhere when you are having so much fun with your cousins. The baby cousins just hung out on the couch while all the sugar consumption was going on. There were actually three babies, but somehow we only managed to get a picture of these two. It is hard to believe that next year they will be running all around with the rest of them! There is lots of cousin love around here. Levi and Griffin are blessed to be able to grow up with so many of their cousins. 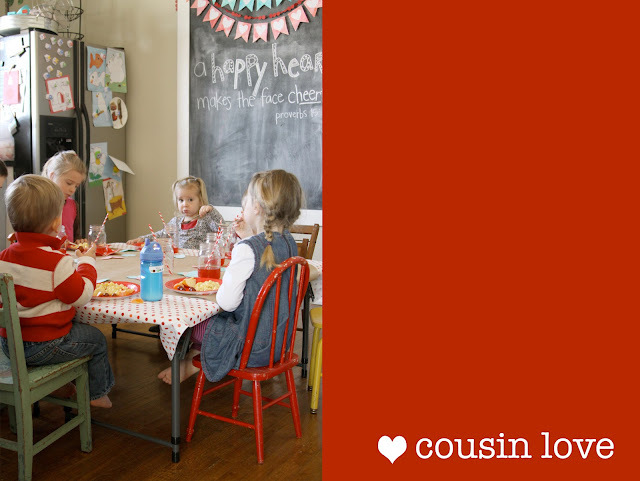 We will definitely have to have a cousin Valentine party again next year. At least I get to plan a girly party once a year, right?! Thanks for the Valentine love ladies! You can see the original post from last year's party here.